On 26 March the Chief Executive (CE) election charade completed its final act. Carrie Lam Cheng Yuet-ngor was chosen by a grand total of 777 votes in a city of 3.8 million registered voters. That’s 0.02 percent! Her main rival, the former financial secretary John Tsang Chun-wah, got 365 votes mostly from the pan-democrats sitting in the elite Election Committee. 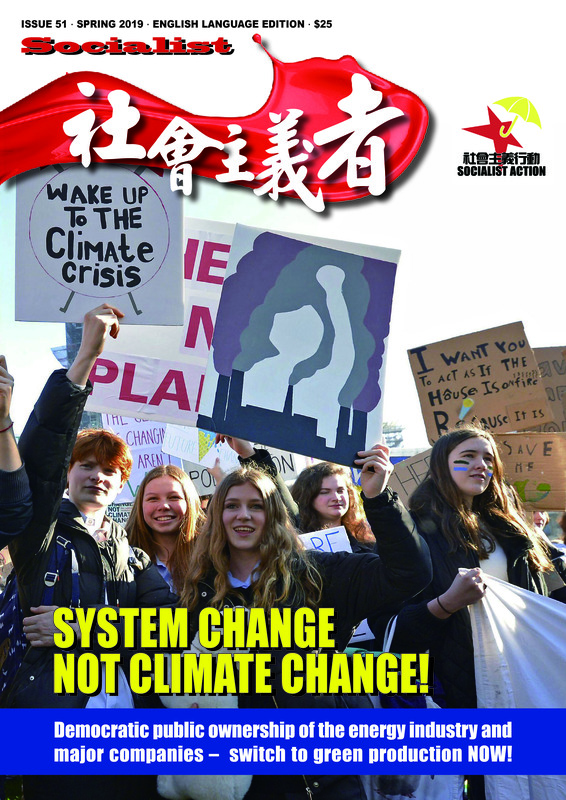 Socialist Action strongly criticised the pan-democratic parties not only for lending “legitimacy” to the sham election process but for supporting Tsang – a central establishment figure who like Lam stands for neo-liberal and anti-democratic policies. Hong Kong’s Beijing-controlled ‘election’ system has taken the concept of election rigging to a whole new level. While the trappings of democracy are in place – street marches, petitioning, political parties – it is the ‘Communist’ dictatorship (CCP) which alone chooses the government and its main policies. Even the Election Committee of 1,194 which is dominated by pro-CCP businesspeople is largely a decorative fixture to mask the fact that the territory’s leader and government are chosen in Beijing. Yet despite a contest that was micro-managed even more than previously, this year’s CE battle could not hide the serious strains and contradictions building up within the CCP’s system for imposing its rule upon Hong Kong. Growing divisions at the top are a reflection of the swirl of mass opposition at society’s base and splits within the Chinese regime itself. The dismissal late last year of incumbent Leung Chun-ying (‘CY’) was one sure sign. He was dismissed because his five-year stint in power has been extremely costly for Beijing, by alienating large sections of the Hong Kong population, undermining support for China’s sovereignty, creating mass support for independence and further discrediting the government’s capitalist agenda. Once Lam was picked as Leung’s successor, with the CCP believing she is best suited to continue his policies of attacking and constraining the democracy movement, her victory was never in doubt. But despite this, CCP officials waged an unprecedented campaign to insure their own loyalists supported her in the vote. Hence we saw the curious spectacle of the CCP furiously working to manipulate an election that was already rigged by design. 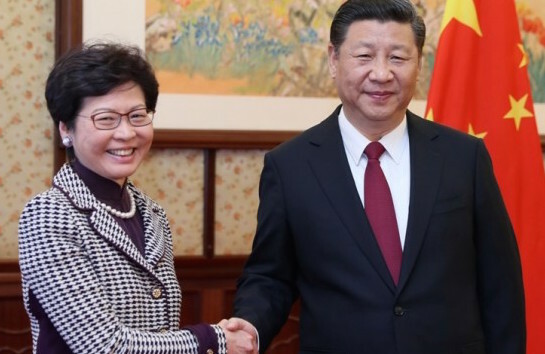 Carrie Lam meets her boss, Xi Jinping. This led to splits and recriminations even within sections of the pro-Beijing camp, as with the venomous hardliner Regina Ip Lau Suk-yee who failed to gather enough nominations and in her own words was “squeezed out” of the contest. Afterwards, Ip’s political advisor Mark Pinkstone, officially commenting without her approval, dismissed the election as a “farce” and complained of “meddling” by Beijing’s officials which he said violated the “one country, two systems” principle (the official term for Hong Kong’s semi-autonomous status). Such comments – in public – are unprecedentedly sharp coming from members of the pro-Beijing camp. By contrast in the 2012 CE election Beijing indicated no preference between the two main candidates, CY Leung and Henry Tang Ying-yen. Tang was initially seen as Beijing’s favourite, but the regime did not intervene when his campaign imploded due to a series of scandals leaked by the ‘CY’ camp. The reason for this year’s excessive “meddling” was the CCP’s fear that a slender win for Lam would condemn her government to “lame duck” status from the outset. It would also further discredit the undemocratic political system. Likewise, Beijing was desperate to paper over the cracks within Hong Kong’s capitalist pro-Beijing establishment by whipping its representatives into ‘united’ support for Lam, preventing any establishment ‘protest votes’ going to other candidates. 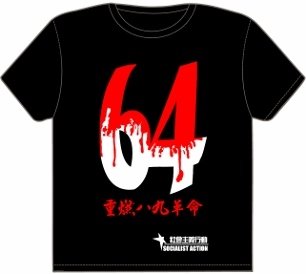 Their aim was that Lam should get a higher vote than the 689 won by CY Leung in 2012. The elite-level divisions have not been bridged and will erupt into the open again, but in the short-term Beijing achieved its aim. Paying the price for Beijing’s aggressive support, Lam emerges as Hong Kong’s least popular CE-elect ever. Her popularity rating in opinion polls is just 30 percent, which is lower than CY Leung’s five years ago. As with Beijing’s economic policies built on the biggest debt pile in world history, the regime has bought short-term political “success” by further undermining its long-term position. Lam has been given the nickname “CY 2.0” which accurately sums up the main direction of her policies: anti-democratic and pro-big business. To shake off her unpopularity she is attempting to distance herself from her predecessor and his slavish obedience to China’s Liaison Office. She is offering “dialogue” and “reconciliation” but this is largely cosmetic. On secondary issues like the unpopular Territory-wide System Assessment (TSA) school exams and calls to re-open a fenced compound at the Government Offices (so-called ‘Civic Square’), Lam may make concessions. But on fundamental issues she cannot offer change even if she wanted to. Her government is hemmed in by the CCP’s deathly fear of democratic reforms and the Hong Kong capitalists’ insistence on unflinching neo-liberal and pro-rich economics. Tsang has been one of the most prominent pro-establishment politicians of the past decade. He served as financial secretary from 2007 to 2016 delivering nine savagely neo-liberal budgets. He achieved infamy by every year underestimating the government’s monster fiscal surpluses – money which he refused to spend to improve public services or address the shameful lack of a universal pensions system. The number of millionaires in Hong Kong more than doubled on Tsang’s watch – from 348,000 in 2008 to 878,000 last year. Meanwhile the number of people in ‘working poor’ families (with at least one wage-earner but under the official poverty line) reached a new record in 2015 of 647,500, according to Oxfam. Neither has Tsang made any secret of his support for enacting Article 23 national security legislation which would severely impact democratic rights. He defends the ‘831’ ruling of China’s dictatorship which forbids genuine democratic elections in Hong Kong. “The pan-democrats crossed a red line by supporting an establishment representative based on the bankrupt argument of lesser evilism,” said Sally Tang Mei-ching of Socialist Action. “It is a violation of what the democracy struggle stands for and unfortunately there are no signs the pan-democrats learned their lesson. We fear they may repeat this fiasco by trying to reach even worse deals with the establishment,” she said. 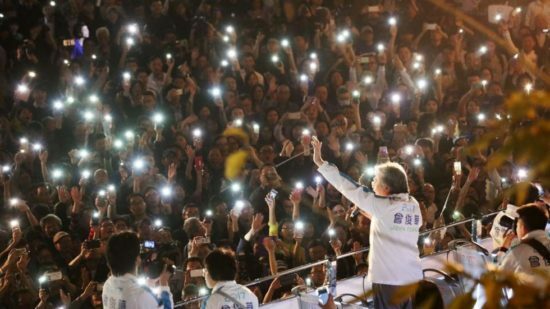 By providing 90 percent of Tsang’s 365 votes in the Election Committee, the pan-democrats lent support to his neo-liberal and reactionary programme. They endorsed the electoral “farce” (the word used by Regina Ip’s political advisor) and even helped spread the idea that president Xi Jinping would come to the rescue at the last minute by ordering a vote for Tsang and saving us all from Lam. It is hard to imagine a more misplaced and desperate ‘theory’. The pan-democrats’ votes also lent credence to China’s ‘831’ ruling insisting on screened establishment-only candidates under the false label of ‘universal suffrage’. This sparked the mass Umbrella Movement in 2014 and that pressure forced the pan-democrats to vote down the proposals in Hong Kong’s legislature (where with one-third of votes they wield a veto). But voting for Tsang in an establishment-only contest is tantamount to accepting Beijing’s narrow framework. Nowhere, and never, has this approach succeeded in winning democratic rights. Mass struggle and a firm, fighting leadership is the only sure approach. John Tsang’s campaign was supported by the pan-democratic leaders. The Hong Kong democracy struggle has stalled and suffered setbacks since the pivotal year of 2014 when Beijing abandoned its pretence and said a loud “no” to universal suffrage. The CCP fears democracy like the devil fears holy water. Even democratic concessions in tiny Hong Kong would start a chain reaction through China leading to its downfall. That is why the idea of compromise with the dictatorship is doomed to failure – like asking the devil to drink “just a little” holy water! Unfortunately, the pan-democratic leaders have drawn precisely the opposite conclusion. The more repressive Beijing becomes the more they cling to the hope they can ‘petition the emperor’ for a deal. An urgent political reorientation is needed – starting by recognising reality for what it is, not the compromise fantasy of the pan-democrats. Socialist Action stands for the rebuilding of the democracy struggle as a fighting grassroots movement, controlled democratically by its base through elected committees. This means a radical change from the elitist ‘main stage’ model that has so far characterised democratic protests, whereby mostly self-appointed ‘leaders’, NGOs and politicians decide all the big questions. The biggest weakness of the Umbrella Movement in 2014, despite its impressive numbers (an estimated 2.3 million people took part), was the lack of a clear leadership and programme. This includes the need to spread the struggle to China. That idea was especially rejected by localist groups (a right-wing chauvinist pro-independence trend), who have become a shocking example of where you end up when you lack strategy. The localists are in full-scale retreat, blaming each other, and in some cases emigrating in order to “love Hong Kong” from abroad. No democratic change can be won in Hong Kong unless it also turns into a struggle for the overthrow of the CCP regime and the capitalist system, which increasingly needs repressive and undemocratic measures to maximise its super-profits. The most important weapon in the fight for real democracy therefore is a new working class party with socialist policies. The role of organised workers as the main social force for winning democratic rights has been shown throughout history, from Brazil in the 1970s-80s to South Korea in the 1980s-90s. By linking this struggle with the need for real jobs, decent wages, and radical action to solve the housing crisis, and financing this through taking the big companies and banks into democratic public ownership, a fighting democracy movement in Hong Kong would echo across China and the region, developing an unstoppable attraction.